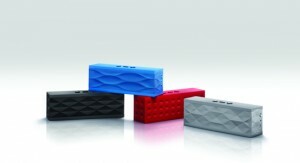 Jawbone is stepping out of their headset only arena and announced the JAMBOX, a wireless speaker and speakerphone. JAMBOX quickly and easily connects with mobile phones, computers, tablets, iPods or any other Bluetooth device, allowing consumers to stream and share music, movies, games, phone and conference calls anywhere and all wirelessly. It can be updated with apps, software and new features at Jawbone’s online platform, MyTALK. Audio alerts offer totally hands-free convenience, letting you know battery life, caller ID, call functions and more. JAMBOX can also be personalized with voice and language options. This is pretty sweet of Jawbone to do because rather then releasing the exact same product with minor upgrades you can just update it and you’re done. The full JAMBOX line is available for pre-order today for $199. JAMBOX will be available at Apple Stores and select Best Buy outlets on November 16, 2010.